Crafters and hobbyists who know how to successfully sell their stuff on the internet will tell you that: selling on Etsy is good but it's not enough if you want to turn crafting into a full time job. And that's your dream, uh? Etsy is the right website to buy and sell handmade goods, vintage items and craft supplies. Its popular community of creatives and people passionate about unique items makes it an ideal first step to grow as a crafty-preneur. But if you just want your artisan business to really work out, you'll eventually need to start an online store that is customized to you and your style. This will let you make the most out of Etsy's visibility to finally get noticed and attract customers to your site (where the income is 100% yours and you don't have to share it with an online platform). Sounds complicated? Well, in this guide you'll learn how to open an Etsy shop and use it to turn your vintage and handmade passion into a real business. Plus, by downloading the article in pdf you'll get exclusive content with powerful Secrets from 9 Crafters who made it online! Creating an Etsy shop is a super fast thing: you can start selling right after registering an account. Remember that you'll need a Paypal account to complete your registration and manage payments from customers. 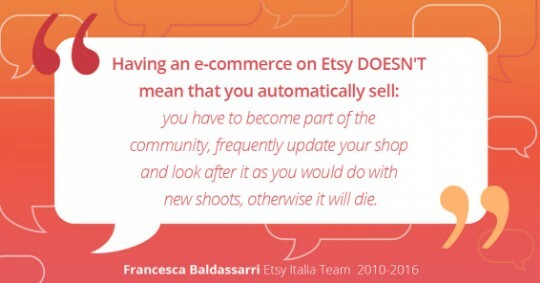 But before that, just take a minute to think about about the useful tip by Francesca Baldassarri, from the EtsyItaliaTeam. You can find it in the exclusive content about experienced crafters' secrets available for download with this article. What does this mean? No matter what marketplace or website creation software you pick, managing an online store takes time and effort. Anyway, if you can't wait to sell arts on Etsy, here's what you need to do to open a shop. Choose a catchy name shop, that recalls your style, your products and target. You should pick an English word, because it's the main language spoken by the Etsy international community of buyers and sellers. On Etsy you can put on sale handmade creations that are all made or designed by you, sell vintage items (at least 20 years old) or crafting supplies. To impress customers, go online with your Etsy shop with at least 20 or 30 items. The competition is high in number and showcasing few creations won't help you look as a trustworthy seller to your potential customers. Making a first good impression is incredibly important, even online! Posting beautiful photos of your products is essential to stand out, so, if you've little money to invest, it's worth hiring a professional photographer. Alternatively, as DIY is your thing (we know that! ), you can watch this video on how to build a Photo Light Box and experiment with small product photography. When it comes to writing an enticing item description, you should include its unique features and tell its unique story: how did you come up with it? How do you make your handmade creations? Etsy customers love crafty tricks and buying from those who share them. Selling at a loss weakens your creations. And it's not relevant to Etsy customers. They pay for quality and prefer unique items over cheap products. But be careful: if competitors sell at a lower price than you do, you could be paying more for supplies than you should. Optimize your costs before changing the pricing list. Packaging is essential to your image. Pick something that suits your shop. A colorful retro design is good if you sell vintage online; paper and cords are the best for selling handmade. Also consider packaging size and weight: they can have a huge impact on your shipping costs. Selling on Etsy isn't for everyone. For instance, it's not allowed to resell an item when you were not involved in designing or making it. That's why, before starting to sell your creations on the internet, it's highly important to understand what can or can not be done on a marketplace like Etsy and think about the alternatives. To help you decide if it's worth it, we wrote down a list of Pros and Cons of selling on Etsy. What makes Etsy a key element in turning your online shop into a profitable business? the network of local peers you can get into. What are the advantages of Etsy for your online shop? shop's features and customization depend on the marketplace. If you want to earn more from your business, you should create an ecommerce website complete with a blog. If you're a DIY lover, you could make a site all by yourself using WebSite X5 do-it-yourself builder. It could be a real shot for you! But if you're afraid you won't be able to publish your site online, the best you can do is pick a ready-made template and customize it on your needs: Crafty Gal Corner is a WebSite X5 Evolution 13 template designed for lady crafters who want to stand out in the market with a "handmade" style that is coherent to their products and brand image. What benefits from an ecommerce website you can enjoy right away? You can use a Blog to post videos and tutorials about your crafting experience. So let's get straight to the point. Etsy is a fundamental online showcase, but it's not the only one out there. What's the winning choice for selling arts and creations online? A personal website + an Etsy shop. This is what you need for Craft Marketing your business, that is all the promotional online/offline activities to need to get noticed as a professional artisan. Optimize SEO: use keywords and tags in your product titles and descriptions and you'll help both customers and search engines find you on Etsy. 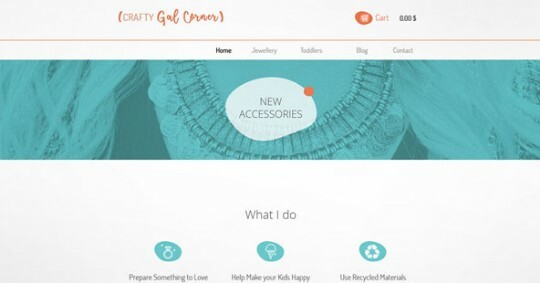 Add your website url to your Etsy profile description. Join Community and Craft Parties: communities like the EtsyItaliaTeam are independent from Etsy but they're a good way to connect with local makers. You can find tips and best practices to sell online or news about offline events with local crafters. Gift your Etsy customers with promo coupons to use on your own website. You could add the coupon into the packaging before shipping. What can not be done on Etsy? Integrating a personal website to an Etsy shop is the best strategy if you want to earn more from selling online. But always keep in mind not to link any of your Etsy product sheets to the ones available on your site. It's not allowed! Now that you know what can be done for selling on Etsy, are you ready to take it to the next level? If all of this is not enough, download the exclusive Secrets from 9 Crafters and instantly get hints from those who made it online. If Etsy is not good enough, being creative is your best chance to make money online.